The Crown Inn01432 860468work RestaurantWinner of the Great British Pub Awards “Cider Pub of the Year” 2015 The Crown Inn has cider and perry at its core! 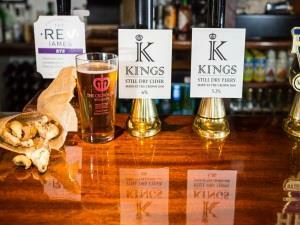 We feature 25 types of Herefordshire Cider and Perry and make our own cider and perry too under the “Kings” Brand. The Crown is at the heart of the village of Woolhope, next to the ancient Church of St Georges. We serve great local produce, simply cooked. Our menu is varied. There are rustic, wholesome dishes but also more restaurant style options. New Wave Seafood of Cirencester supply us with day boat Cornish fish for the specials board. Our 3 Counties sourced meat is butchered on site allowing us to serve a great steak selection as well as our varied menu. We cater for coeliacs and most dietary needs, just ask one of the team. We are happy to arrange special cider tasting events for parties of 10 or more and can match a menu for the evening. We are offering customers an extra special offer! When they next visit the pub ask for one of our loyalty cards that can be used on future visits for 25% of your food bill Mon-Thurs! Winner of the Great British Pub Awards “Cider Pub of the Year” 2015 The Crown Inn has cider and perry at its core! Cider & Perry Tasting, Cider Producer, Perry Producer, Cafe on site, Sales on Site, Guide Dogs Only, Coach Groups Accepted, Hen/Stage Parties Accepted, Toilet Facilities & Wheelchair Access. From B4224 Hereford-Fownhope, turn left between Moon Inn and the bridge, signposted Woolhope. At the T junction in Woolhope, turn left and The Crown is on the left.